Lentils are a very inexpensive, fat-free source of protein, can always be on hand in your pantry, and are very versatile. Whether you use them in soups, braise them as a side dish, incorporate them into veggie burgers or use them in salads as I do in this recipe, lentils are nutrient rich for very little cost and more families should add them into their weekly menus. For this simple salad I mixed cooked lentils with diced sweet red pepper, green onions, fresh parsley, and then lightly dressed everything with a zesty lemon flavored vinaigrette. This salad can be made even a day ahead and travels really well making it an excellent choice for picnics or outdoor dining. Lentils are a great source of fat-free protein, and are rich in folate, B vitamins, fiber, and iron. Peppers contain carotenoids which boost immunity and fight cancer and are rich in vitamin C.
The dressing used for this salad includes olive oil, a heart healthy mono-saturated fat rich in antioxidants. 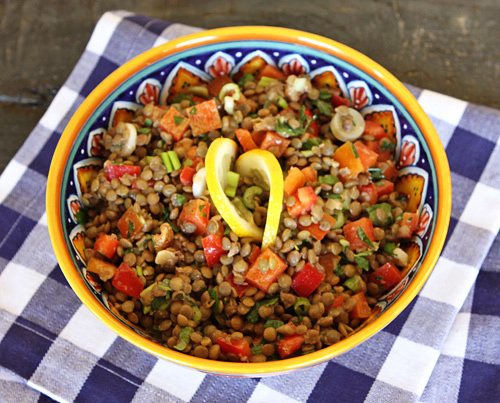 A lemony lentil salad that can be used as a side dish or light lunch entree. Cook the lentil until just tender in a pot of boiling water. Drain well, rinse, and then allow to come to room temperature. In a bowl, toss together the lentils, peppers, onions, and parsley. In a smaller bowl, whisk together the lemon zest, juice, mustard, salt and pepper. Toss the lentil mixture with the dressing and refrigerate until ready to serve. Serve the salad cold or at room temperature.